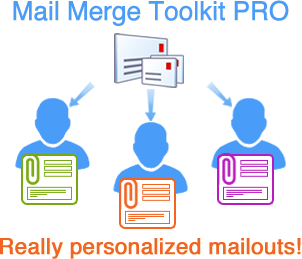 Meet a new edition of Mail Merge Toolkit for Outlook! We would like to introduce a new edition of our award-winning mail merging app for Microsoft Outlook and Word - Mail Merge Toolkit PRO! Since 2003, thousands of users all over the world have chosen Mail Merge Toolkit to realize highly-efficient and user-friendly mailings, because it contains all the 'must-have' expansion features beyond the built-in Word/Outlook mail merge capability to achieve an extreme level of personalized mailouts. Personalized email subject, unique attachments for each recipient, mailing of personalized PDF files and other features provide the completed set of capabilities for smart and convenient email distribution. The newly introduced edition of the product is Mail Merge Toolkit PRO, which includes the feature most requested by corporate users: Mail Merge by SharePoint List. We now can offer a solution that truly transforms routine inefficient mailing into an organized business process. Important notice! We strongly advise to pay attention to our license upgrade policy: all current users of Mail Merge Toolkit (standard edition, purchased until March 1, 2018) with non-expired license services can upgrade their license from standard to PRO absolutely FREE OF CHARGE until May 31, 2018. You are welcome to contact our sales team to obtain a new license (please don't forget to include your current license key or Order ID# in your request).